Kolkata (previously named Calcutta) is one of India's most fascinating cities and has long been a highly successful tourism destination. The historic district is riddled with grand colonial-era architecture, but away from the vibrant modern city there are some portions of its population still gripped by some of the direst poverty in India. Huge numbers of tourists come to Kolkata each year for the sightseeing, to visit the mission of Mother Teresa or to join the pilgrims at the remarkable Kalighat Kali Temple. There are also some giant air-conditioned malls, superb Bengali dining opportunities (particularly around Park Street), and various venues showcasing Bengali dancing. When first arriving in Kolkata, head over to the West Bengal Tourism Centre on the BBD Bagh East (a central plaza) for up-to-date tourist information. The India Tourism outlet on Shakespeare Sarani is another good source. A large number of the sights within Kolkata date back to periods of the 18th century onwards and some of the most spectacular are to be found alongside the Hooghly River, including a number of 'ghats' (stairs leading down to the river). 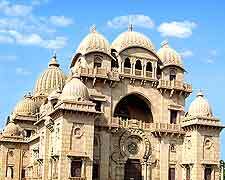 Completed in 1898, one famous riverside sight is the Belur Math Shrine, which operates as the headquarters for the Ramakrisha Mission and is located in the northerly suburb city of Howrah. Another striking attraction in northern Kolkata is the Paresnath Temple, a Jain temple completed in 1867 to honour Sheetalnathji, a renowned Jain teacher (tirthankar). If you are on holiday here with your family, then a trip to the Botanical Gardens may be worth considering, or a day out riding the roller coasters at Nicco Park. If golf is more your scene, then a round at the Royal Calcutta Golf Club (RCGC) will be in order. 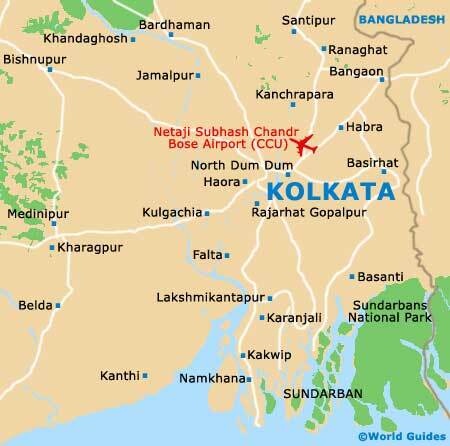 More information about Kolkata Tourist Attractions. Several striking landmarks are littered around Kolkata and often stand out on the cityscape. The Howrah Bridge is especially prominent and important, and also goes by the name of the 'Rabindra Setu', while the extravagant Marble Palace is a more traditional sight for tourists to savour, with its seemingly endless use of marble and opulent furnishings. British visitors will enjoy admiring the domed Victoria Memorial, which is dedicated to Queen Victoria and surrounded by well-maintained grounds. Other sights to see include the South Park Street Cemetery, the relatively modern Birla Mandir Temple, and the whitewashed St. Paul's Cathedral, which dates from the mid-19th century. 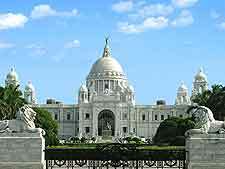 More information about Kolkata Landmarks and Monuments. If you are a fan of all things cultural, then the huge selection of museums in and around Kolkata will definitely be a good reason to holiday here. Chowringhee Road is where you will find the Indian Museum and its staggering number of artefacts, which include fossils, Egyptian treasures and allegedly, the ashes of none other than Lord Buddha himself. Also on Chowringhee Road is the Nehru Children's Museum, where information about the Hindu religion is explained by means of stories, dioramas and models. Situated on the JBS Haldane Avenue is the world-class Science City, which is the biggest science centre of its kind in the whole of the Indian subcontinent. Science City came into being in 1997 and enjoys annual visitor numbers now exceeding one million people, who come to see the Dynamotion Hall, the Earth Exploration Hall, the Evolution Park, the Maritime Centre and the Space Odyssey attractions. Visitors simply looking for a good gallery can choose between the Birla Academy of Art and Culture, the Centre of International Modern Art Gallery (CIMA) and the Academy of Fine Arts. 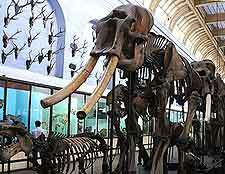 More information about Kolkata Museums and Kolkata Art Galleries. Kolkata is an especially popular Indian city and many say that it ranks as nothing short of India's cultural capital. Those taking a break and staying in Kolkata often take advantage of its position in West Bengal, since it lends itself to a choice of day trips and excursions. To immerse yourself in native wildlife, a visit to either the Gorumara National Park or the Sundarbans National Park will be sure to please. Alternatively, the towns of Bishnupur (around two and a half hours) and Shantiniketan (just under three hours) are both within reach, with Bishnupur known for its terracotta temples and Shantiniketan for its prestigious university, the Visva-Bharati University. Some three hours away and to the south are the sandy beaches of West Bengal, with the beaches around Digha, Frazerganj and Shankarpur being amongst the best in this region. 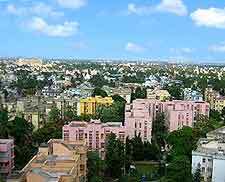 More information about Kolkata Attractions Nearby.